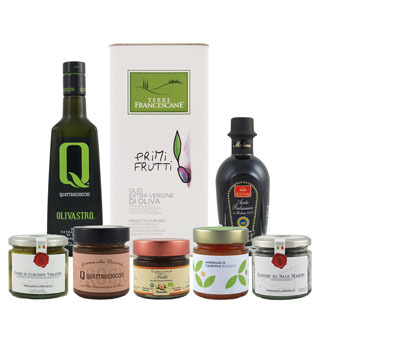 This 100% Taggiasca olive oil is produced in the town of Isolabona in the west of Liguria, near both the Italian Riviera and Italy's border with France and Monaco. The name "S'ciappau" relates to how the Cassini mill does not completely crush the olives used for this oil. This practice, together with the absence of water during the separation phase, allows a more fruity and fragrant oil to be obtained. The result is a delicate and balanced flavor, with only slight bitter and spicy notes, making the oil a great choice for children and those who prefer more elegant flavors. You can expect aromas of fennel, cut grass and green almond. A great all-around oil for both cooking and dressing, it pairs well with fish, steamed vegetables and white meat, and is ideal for making salsa, pesto and mayonnaise. A cute gift set of organic oils from the award-winning Córdoban producer of Morellana.